Versatile, yet so easy to prepare, this delicious frittata is the perfect recipe to serve as part of your next brunch, lunch or dinner menu. Remove and discard casings from sausage. Crumble sausage into large ovenproof nonstick skillet; cook on medium heat 5 to 7 min. or until evenly browned, stirring frequently. Drain. Wipe skillet with paper towel. Melt margarine in skillet. Add eggs; cook (without stirring) 3 to 5 min. or until centre is almost set. 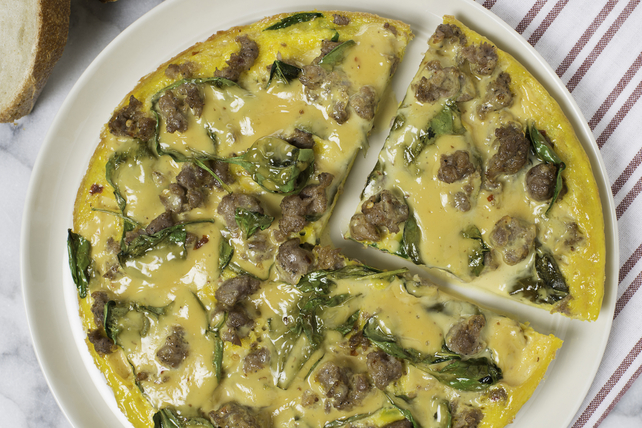 Top with sausage and spinach; drizzle with dressing. Bake 10 min. or until centre of frittata is set. Sprinkle with 1/4 cup Cracker Barrel Shredded 4 Cheese Italiano Cheese before serving. Serve topped with salsa and with baguette slices on the side.